In context, this verse is to those who are workers, tired and weary, bearing a lot of burdens, and instructing them how to find rest. It is odd, when you first read it, that the instruction is to ‘take my yoke upon you’, adding more to the load of the weary it would seem. But not all loads are heavy. You won’t feel as tired carrying a box of pillows as a box of cinder blocks. What is different about the load that Jesus instructs us to carry is that it is first not a load, but a yoke. A yoke is used go guide a farm animal through a chore like plowing land. 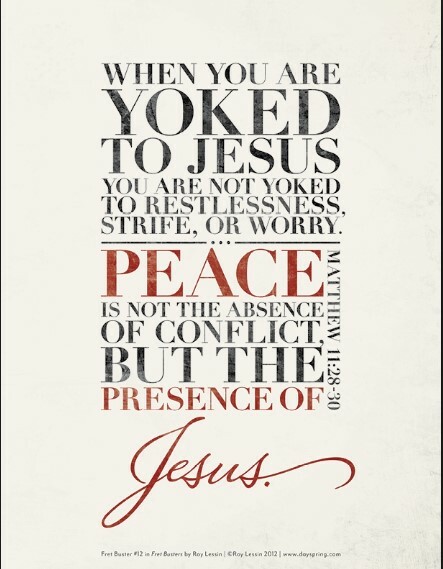 Jesus asks us to let him be our guide by taking on His yoke. There are two things he tells us about that yoke. It’s gentle, and it’s “lowly in heart”. Meekness is the opposite of prideful, and is what “lowly in heart” means. Pride will cause a lot of undue stress and struggle in your life. It’s a will to never feel second place, when in fact, the will of God is that we all be servants, which means we will all be second place on this earth. That servant attitude is not only for the recipient – but also for the servant. Humility is a good thing, reducing our self-pride and causing us not to think higher of ourselves than we should (Romans 12:3). You’ll be less likely to live with the stress of what others thing of you when your pride replaced with a “lowly in heart” attitude. 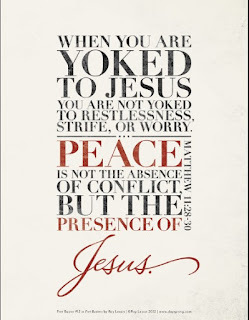 The second attribute of the yoke of Christ is that it is gentle. I think this is best described in a few verses where the word is used. Titus 3:2 says “To speak evil of no one, to avoid quarreling, to be gentle, and to show perfect courtesy toward all people.” James 3:17 says “But the wisdom from above is first pure, then peaceable, gentle, open to reason, full of mercy and good fruits, impartial and sincere.” Ephesians 4:2 says “With all humility and gentleness, with patience, bearing with one another in love”. To be gentle is to live with others peacefully and through God’s wisdom. Gentleness is how a shepherd treats his sheep, and how we should treat each other if we are to show the love of Jesus. Living with a selfless gentle attitude is part of the sanctification process of believers. It makes us more like Christ, whom we profess to follow. And while it may seem like we’re taking on yet another “chore” or yoke, and carrying yet another burden to hold ourselves accountable to, the truth is that this is the way to rest in this world. This is the working of righteousness in us. Lord, let this be our daily yoke! Guide us to always be gentle and humble.